We finally got a CiCi’s Pizza in Henrietta, NY. After I shoveled the sidewalks, we headed to CiCi’s for lunch. For about $15 for two people you get all-you-can-eat salad and pizza and sodas. I had been to one in Dallas a few years ago, and we also went to one in North Carolina a while back. If they opened one in Palmyra, it would recoup it’s franchise fees the first Hill Cumorah Pageant season. If you’ve never been to one, you can tell them what you want on a pizza, and they’ll fix it and bring it to your table. Otherwise, you can just get what they have at the pizza bar. It’s not the best pizza I’ve ever had, but it is pretty decent. We also picked up a heater for Elizabethe’s craft room. She’s been putting up with that cold room every winter. So, I’m going to replace the gas fireplace with a gas heater. It’s a 30K BTU unit which should heat up her room fairly well. The media is all over the “fiscal cliff” issue. The Republicans are blaming the Democrats, and the Democrats are blaming the Republicans. The executive branch is blaming Congress, and yet, they are all getting raises tomorrow. I find it repulsive that any of them are getting paid at all. My repulsion is only second to the fact that many of them were recently re-elected. Let’s remember what happened just one year ago. At the last-minute, they voted to keep the tax cuts for 60 days instead of extending it for a year or two while the economy recovers. Then, 60 days later, they voted to extend it to the end of the year. Why do we as voters put up with that? I really wish we would stop blaming along party-lines. If you look at last December’s vote on the tax cuts, it wasn’t along party line. In fact, they didn’t even record the votes!!! When I called my congresswoman’s office to ask for the roll-call I was told it wasn’t recorded because everyone vote “Aye”. You have to ask yourself, why couldn’t they all vote “Aye” on extending it 12, or even 24 months? Too much bipartisan bickering is why. I don’t see it getting any better. There’s too much voter fraud and corruption, and until they put a corruption-proof election system in place, it will continue. This entry was posted in Beckwith Mansion & Estate, Latter-day Saints, New York, Pageant 2013, Palmyra, New York, Politics, Restaurants, Rochester and tagged CiCi's Pizza, current-events, Democrats, gas, heat, Hill Cumorah Pageant, Hill Cumorah Pageant 2013, natural gas, Politics, Republicans, restaurant on December 31, 2012 by dbwaltonm. 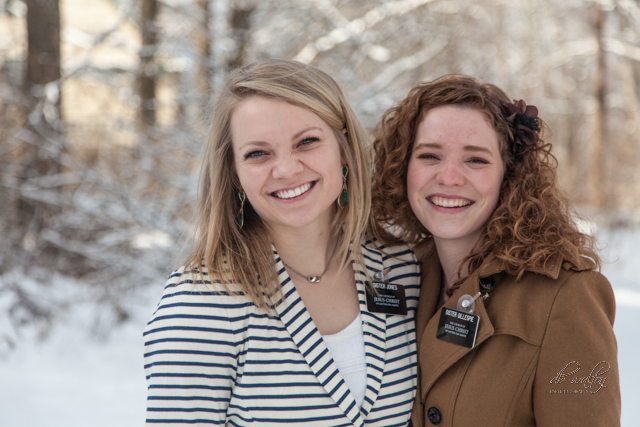 Sister Gillespie and Sister Jones came to dinner tonight. We had white bean soup with ham, whole wheat muffins (which turned out perfectly), and chocolate/hazelnut mousse for dessert. Sister Jones had never seen the house, so Elizabethe gave her a tour. My friend, John Kidd, called from California and we had a long talk about cameras, The Friend, and what’s out here in New York. I’m still trying to convince him to come visit. This entry was posted in Beckwith Mansion & Estate, Latter-day Saints, New York, Palmyra, New York and tagged California, cameras, chocolate hazelnut, food, guide, Missionaries, restaurants, sage, teaching, white bean soup, whole wheat muffins on December 30, 2012 by dbwaltonm. I needed to run some errands today. I picked the wrong day to go out. Yesterday was nice, today is down right nasty. It’s cold, and snowy. So, I planned my route carefully. I managed to get stuff at Lowe’s and Walmart, and then headed home. When I got home, the driveway was covered again. So, I cleared it so tomorrow morning it won’t be as bad to clear. They say we’re only supposed to get 1-2 inches, but we’ve already got 2 inches. We’ve already got a mountain of snow between the studio and the garage. If I have to call a plow again, there won’t be room to put the excess snow. Tomorrow is Sunday, and I really hope I don’t have a ton of snow to move before driving to church. We’ll see. It’s been snowing all day and it is supposed to stop soon. This entry was posted in Beckwith Mansion & Estate, New York, Palmyra, New York and tagged cars, errands, excess snow, plow, Snow, weather, winter on December 29, 2012 by dbwaltonm. After the snow we got yesterday, I’ve been playing catch-up. It seemed like my office never did get warm. 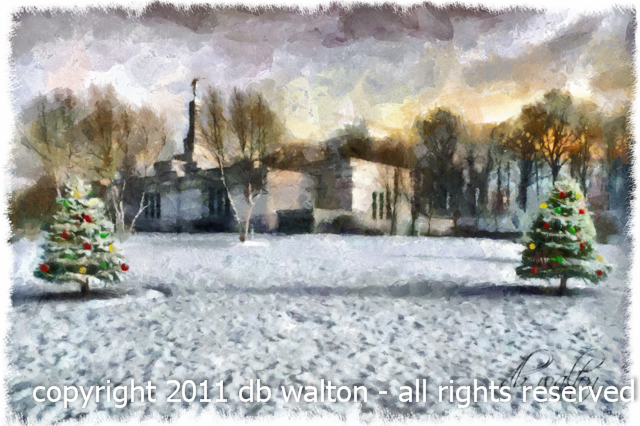 This entry was posted in Beckwith Mansion & Estate, New York, Palmyra, New York and tagged Snow, weather on December 28, 2012 by dbwaltonm. This morning I woke to more snow than I’ve seen since we bought the house in Palmyra. So, I did some research. I found the most snow Palmyra has received on a December 27th was 15″. (I couldn’t find what year that was.) The median snowfall on a 12/27 is 0.5″. The mean snowfall for any day in any December is also 0.5″. The average snowfall for the month of December is 12″. Putting all that together, we get about 12″ spread over the entire month of December, mostly light 1/2″ dusting. That has been our experience until today. Today I took the tape measure out and found some places where it wasn’t drifted, and wasn’t wind-blown. (I also poked around to find an average.) We got 12.5″. Now, keep in mind that NOAA uses melted snow to determine actual snowfall. This was a very dry powder without much water content. So, NOAA will probably report less when they post the data. Our renter helped me clear the back driveway, and I started on the front when it started to snow again. We didn’t get much more snow, but it was enough that I decided to go in out of the cold. Finally, I went out right before sunset and cleared a path to the street. All that snowplow blow-back was HEAVY. I got about 12’x3′ done and I had to go in. It was just too heavy to do much more. I just hope we don’t get dumped on during the night. Our regular snowplow guy has retired, and we left messages for the others. Although today was not a record, it, combined with the snow a few days ago, might put us well over the average for a December. By the way, the largest amount of snow fall for Palmyra typically takes place at the end of February, start of March. This entry was posted in Beckwith Mansion & Estate, New York, Palmyra, New York and tagged amount of snow, average snowfall, December, nature, NOAA, Snow, snow fall, snowfall, snowplow, weather, winter on December 27, 2012 by dbwaltonm. Elizabethe and I went to see Les Misérables. It was a full house at the Regal in Victor. I was really surprised that Russel Crow could sing. After Pierce Brosnan’s really bad performance in Mama Mia, I’ve been really reluctant to see musicals produced in these times, but Russel Crow, Hugh Jackman, and the rest of the cast really did a great job with this musical. When the last scene of the movie played, there wasn’t a dry eye in the house. You could hear people crying and sniffling all over the theatre. It’s a tear jerker scene as it is, but Hugh Jackman and Anne Hathaway will have you in tears. It’s a must see movie. The story, based on a book by Victor Hugo, is one of forgiveness and repentance. Jean Valjean, arrested for stealing bread to feed his sister’s son, has been released on parole. He breaks parole after being forgiven by a priest for stealing from the priest. He vows to turn his life around. In the mean time, the prison guard/police officer Javert vows to bring Jean Valjean to justice. That’s as much as I’ll say about the plot. If you have never seen it, you need to go see this version of the story. As we left the theatre it was snowing. So, we just came home and stayed in for the evening. This entry was posted in Beckwith Mansion & Estate, New York, Palmyra, New York and tagged Anne Hathaway, drama, entertainment, Hugh Jackman, Les Misérables, movie, musical, pierce brosnan, russel crow, Snow, victor hugo on December 26, 2012 by dbwaltonm. We got up early to start preparations for our big breakfast with the missionaries. I had to calculate when to put what in the oven and when to start the waffles and pancakes. The elders were a few minutes early, so Elizabethe asked them to shovel the walk so the sisters don’t have to tread through the snow. They eagerly ran off to do that. After that, we took a few pictures inside, and then the missionaries shared a spiritual thought with us about Christmas and the wisemen. 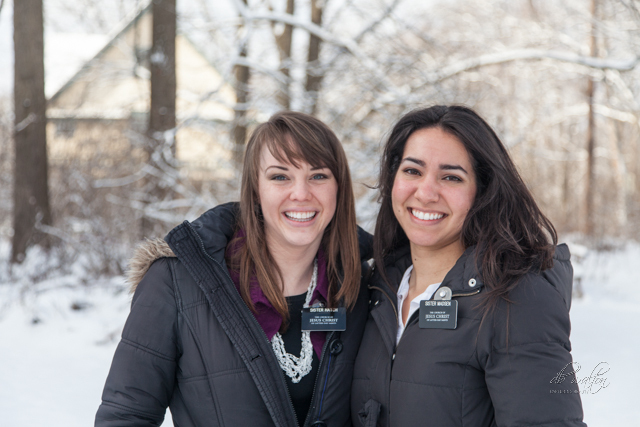 It was then outside for a few shots in the snow… oh, yes… it is a White Christmas here in Palmyra. We got about 1″ on top of what we already had on the lawn. After the missionaries left, and we got things cleaned up, Elizabethe and I watched some old Alfred Hitchcock shows while mounting 8x10s in 11×14 mounts and packaging them. When that got done, we took a short snooze and then watched High Plains Drifter. It was a quiet Christmas, but a very nice one. 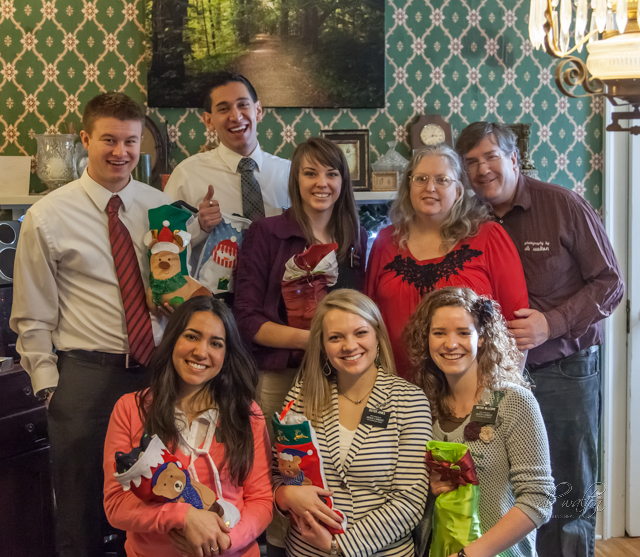 This entry was posted in Beckwith Mansion & Estate, Latter-day Saints, New York, Palmyra, New York and tagged breakfast, Christmas, Latter-day Saints, LDS, Missionaries, Mormon on December 25, 2012 by dbwaltonm. I actually worked this morning. I am working on a request from Professional Photographer Magazine, and so I wanted to get it done before Christmas. Aside from that, and a short errand, it was a quiet day in anticipation of tomorrow. 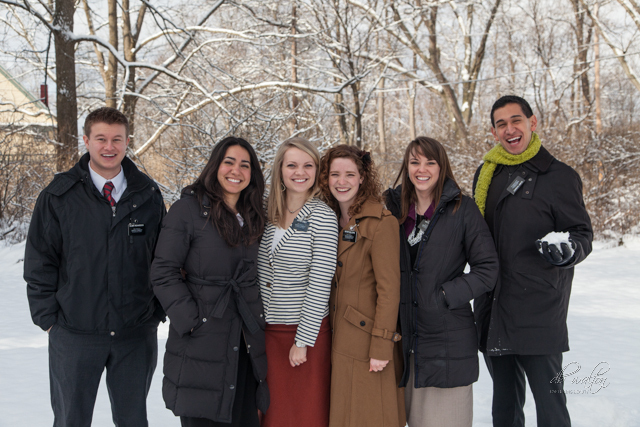 In the morning, 6 full-time missionaries will descend on our home for breakfast. We’re excited about it. 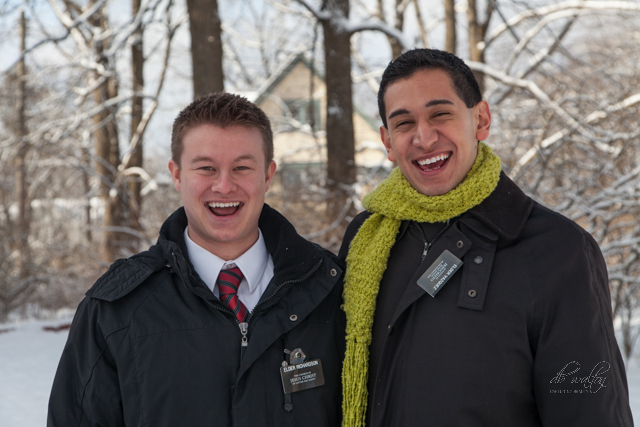 This entry was posted in Beckwith Mansion & Estate, Latter-day Saints, New York, Palmyra, New York and tagged Christmas Eve, Missionaries on December 24, 2012 by dbwaltonm. The bishop and one of his counselors talked in church while the choir sang three pieces and the primary also sang a few songs. It was a delightful service. Christmas in Palmyra is a unique experience. I like what President Hinkley said regarding what took place here nearly 200 years ago. He said, “No more important or compelling testimony has been given of the Risen Lord than this testimony of His own Father.” Aside from a pilgrimage to Bethlehem, I cannot think of a better place to be during the Christmas season. This entry was posted in Beckwith Mansion & Estate, Latter-day Saints, New York, Palmyra, New York and tagged christmas season, Church, Palmyra, pilgrimage, religion on December 23, 2012 by dbwaltonm. Some think we’ve been destroyed, but contrary to that rumor, we’re still around. Perhaps what the Mayans realized was our mild fall would be followed by a day of true winter. I woke this morning to wind and snow. This morning is probably one of the biggest snow falls in one night since I’ve moved here. After a good breakfast, I went outside to tackle the snow. After about 5000 sq ft of driveway, I moved on to clear the village sidewalks in front of my house. This time, I measured them. 255 feet of sidewalk, at 5′ wide, comes to another 1275 feet of sidewalk. Let’s see, at 6″ deep, that’s about 140 cubic yards of snow. No wonder I feel like I’ve had a workout. Do you realize that they measure the depth of snow, not by the actual depth, but by the amount of water produced when it melts? I actually measured the depth on the driveway. It was 6″. Now, since a wetter snow will yield more water, the National Weather Service might report a deeper depth, and had this been a dry snow, the report might be less. This was a very wet, heavy snow, so my 6″ on my tape measure might actually be recorded on NOA page as 8″. I’ll have to remember to check. Because I enjoy shoveling snow, this was a nice way to start the day. It took longer than usual because the snow was so heavy. Normally, I can push about 10′ before it gets too heavy. Today, 3-5′ and it was too heavy to push, so I had to work in small patches, pushing a few feet of snow to the side each time. It is supposed to keep snowing through tomorrow. I just hope I don’t have to shovel before church. That’s always a bit of a drag. This entry was posted in Beckwith Mansion & Estate, Latter-day Saints, New York, Palmyra, New York and tagged Beckwith Mansion, dry snow, mild fall, national weather service, nature, Palmyra, shovel, Snow, snow fall, Village of Palmyra, weather, wet, wind, winter on December 22, 2012 by dbwaltonm.